For Marvel, Kathryn Immonen helms the one-shot Avengers Origins: Thor. DC Comics is releasing a new miniseries based on the video game Uncharted and a relaunch of Nick Spencer's superhero series Thunder Agents. DC is also reprinting Dwayne McDuffie's Batman: Dont Blink and Brian Azzarello and Joe Kubert's Sgt. Rock: Between Hell And A Hard Place. 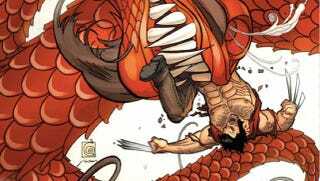 On Wednesday there are new issues of Uncanny X-Men, Daredevil, FF, Angel and Faith, Spaceman (here's our exclusive preview of that great scifi book), Wolverine, Star Trek, Fables, and Jack Avarice Is The Courier (exclusive preview here). Also, the new issue of Game of Thrones (below) deserves some sort of award for bafflingly bad covers. Just looking at veiny Khal Drogo and crying Daenerys gives me the "ick shivers." I'm too busy to name this honor right now. Supply your own suggestions in the comments! The must-buy this week is the third volume ("Romance At The Speed Of Light") of Jeff Smith's subtle and weird universe-hopping noir RASL. We have no qualms saying nice things about it. And although it's not a graphic novel, the Tintin Complete Companion promises such treats for Hergé die-hards like his "drawings are side by side with their references, demonstrating how he established believable backgrounds and realistic details." Comic industry satire webcomic The Gutters is also getting an omnibus of its mordant strips. Other bookshelf material out this Wednesday includes a compilation of Dave Gibbons' Doctor Who comics, the Hellboy-centric melange of BPRD: Being Human, new printings of the Walking Dead and Batman: Hush omnibuses, and Joe Casey and Andy Suriano's brand new medical horror graphic novel Doc Bizarre MD. And as usual, here's the list of everything being released to comic stores tomorrow, and you can find your nearest comic retailer here. Happy reading, gang!